It has been so gorgeous out lately. Here in Eastern Nebraska we have hit triple digits already. There may have been snow on May 1 but that is a distant memory. The farmers markets have two weekends under their belts. Warmer weather always has me wanting to eat light and fresh. Grilled meat on a salad is a big summer favorite of mine. 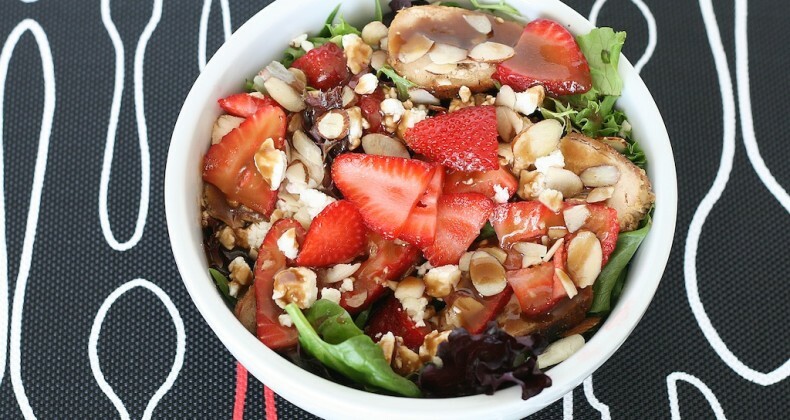 Strawberries in a salad with tangy feta or goat cheese is another favorite. When I was sitting in the airport in Atlanta recently we ate at TGI Friday’s. On the menu was a Strawberry Fields salad. 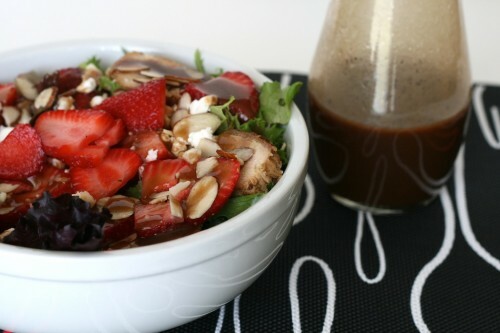 It had strawberries, Parmesan cheese, goat cheese, pecans, I added chicken to mine, and it was swimming (swimming) in a balsamic vinaigrette. It was very tasty however, I couldn’t wait to come home and make my own salad with a lot less vinaigrette. Well things have been a little busy since I’ve been home so I didn’t think about that salad until I got asked about low fat/fat free salad dressing options. If you have better insight about these type of dressing options please chip in in the comments section. Personally, I think fat free salad dressing tastes like a bunch of chemicals. It is HORRIBLE! My recommendation was to make a vinaigrette. This way you can control the type and amount of oil you’re adding on your salad. There are tons of different vinegars and oils available even places like Walmart are starting to carry a greater variety. Pick an oil, then a vinegar, added chopped fresh herbs or dried herbs, minced garlic, shallots, or onion… seriously the flavorÂ combinationsÂ are endless! Because of that question I was inspired to make my own vinaigrette and I happened to have a leftover grilled chicken breast, strawberries, and goat cheese in the fridge. How about that? This salad was meant to be. Kasper (age 21 months) and Penelope (age 5) both loved it, in fact, they both had a second helping! Since homemade vinaigrettes don’t have preservatives in them you will want to make them in small quantities. This way you can be constantlyÂ experimentingÂ with new oils/vinegars/herbs. This vinaigrette makes about 6 -2 tablespoon servings. Perfect for a dinner party. Keeping to that 2 tablespoon serving size means your salad won’t be swimming in dressing and you will actually be able to taste everything! This dressing is brown and not very beautiful, but it makes up for it with it tangy punch. Plus get this there is only 70 calories per serving! Low calorie and good tasting! 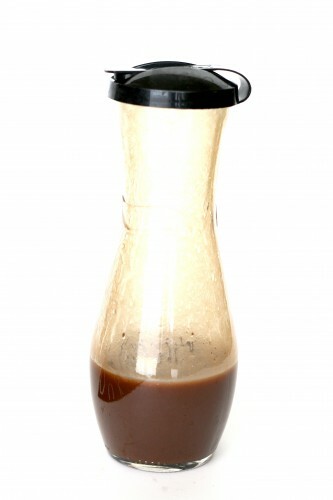 The vinaigrette should coat the sides of the jar when it is ready to use. Store in the fridge for up to one week. If it separates give it a shake.